Company Overview: For the past thirteen years, LinkedIn has earned its repute as a professional networking and social media platform. Social networking pioneer and former PayPal executive, Reid Hoffman, brought together a team of talented entrepreneurs to found LinkedIn in late 2002 and early 2003. Since then, the company has opened up international offices, received sizable investments from prominent venture capital firms, and become a publically traded entity on the New York Stock Exchange. Jeff Weiner, prior Yahoo! and Warner Brothers Online leader, currently serves as Chief Executive Officer for LinkedIn. As of 2015, LinkedIn has over 400 million members, growing at a rate of two new users every single second. This platform truly is global—with 70 percent of its user base located outside of the United States, it reaches more than 200 countries and territories. In 2012, the corporation further enhanced the site’s functionality by purchasing 15 additional feature patents. LinkedIn members utilize the site by creating professional profiles to showcase their skills, communicating publicly and privately with each other, posting and reading articles, participating in interest groups, browsing through job postings, submitting applications, and more. This platform assists users in promoting themselves, connecting with colleagues, finding positions, and establishing themselves within their fields. LinkedIn’s official slogan is “Relationships Matter,” as their objective is linking professionals with each other and important opportunities. Linkedin’s revenue was $2.21 billion in 2014. Its earnings are primarily derived from providing access to key user data to sales representatives and recruiters. The company has over 9,200 employees spread across the world. LinkedIn is one of the most recognizable, respected companies in the social media sphere. Excel Consultant was thrilled to work with such a giant in this field, lending our Microsoft programming expertise to their dedicated team in order to improve their service and optimize their operations. The Challenge: LinkedIn brought on Excel Consultant’s top Microsoft Excel MVP (Most Valued Professional, a title given my Microsoft to only the highest performing programmers and trainers) for a special project in their finance department. 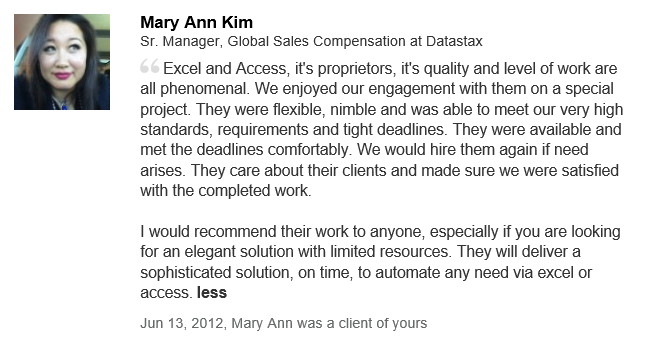 The company asked us to integrate and automate several Global Sales and Compensation tasks using Excel, Word, and Outlook. We worked with employee information and statistics, personnel documents such as recommendations for bonuses or raises, and other key data. LinkedIn asked us to take this information and push it from Excel files into Word so it could be automatically emailed to employees and executives. This was similar to a mail merge (a process by which a program automatically includes names and addresses on documents to be mailed for promotional or other purposes), but somewhat more complicated, especially since we were working with important, sensitive employee information. Ultimately, we needed a way to generate reports with the user doing very little other than clicking a few customized buttons. Coding a way to easily and effectively collect, analyze, compile, and send vast quantities of financial and personnel related data was no easy task, but our team took it on. Led by one of our Microsoft MVPs, our programmers got to work, using their extensive understanding of Microsoft applications to integrate their functions and develop a design suited to LinkedIn’s particular needs. We used a substantial amount of complex VBA, or Visual Basic for Applications. Our team employed this Microsoft specific programming language to create macros, coding patterns that automate operations by producing specific outputs depending on user inputs. We relished the challenge of combining numerous Microsoft applications to deliver an outstanding product. Cooperating with a major name in the technology world meant we had to perform exceptionally, especially given a demanding deadline and the intricacy of the task. Key Client Benefits: We successfully completed our assignment, saving LinkedIn and its staff valuable time in communicating pivotal personnel and financial information. The company’s employees can click just a few buttons and have individualized reports sent to colleagues and coworkers. We heard nothing but praise for our efforts from the company. 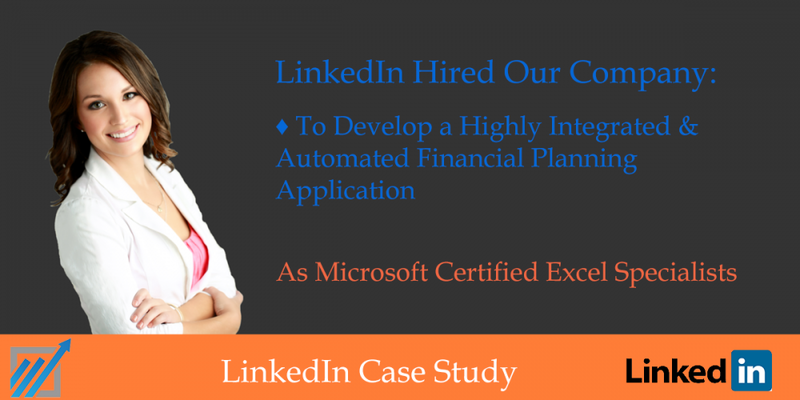 In fact, a few years after completing this project, LinkedIn came back to Excel Consultant and we assisted them with a marketing assignment. We have an 83 percent client repeat rate, and we’re proud to count LinkedIn (as well as Microsoft itself) in that category. If you require automation and integration of Microsoft applications, or if you simply want to work with some of the most esteemed Excel experts, contact us today to find out more about our services or schedule an appointment. In addition to customized consulting and programming, we offer training programs, workshops, and more. We look forward to helping you make the most of Microsoft for your business!